It is a truth universally acknowledged, that a single woman in possession of a good head, must be in want of greener pastures. We have Linee (Benz Pornchita) a man hater who is too smart for her own good. She works for a nonprofit firm that protects women from domestic abuse, trafficking etc. She’s confident and prefers to see men on the judgment table, preferably sued or locked up. There are hints that she must have been hurt in the past and has severe mistrusts in them. So it’s not surprising – but equally engaging – when she meets her match in Wayu (Aun Witaya), owner and operator of a renowned bar/club franchise. She believes they are dishonest and involved with illegal activities. Wayu is attracted to Linee because she is like a book that you can read over and over again. He’s quite intrigued in her. Linee’s greener pasture is to do what she loves, which is protecting women, so she may come off a little strong, but deep down she too wonders if her prejudice in men is causing her to overlook good men too. Meet Maple (Joy Rinlanee), our resident control freak and rich women. Despite being born with a silver spoon, she’s a capable Editor in Chief for “It’s a Must” magazine. Maple believes that she’s rich, beautiful and single and can have any man she wants. That was her mentality during college and throughout her career. She thinks she has the time to meet her soul mate, until a monkey wrench is thrown into her path. Not only are her once-best-friends tormenting her with a challenge, her granny has engaged her to a gay man – not that granny knew the man is gay. Maple’s perfect world seems to collapse overnight and right in front of her new intern who happens to be 10 years younger than her! The intern, Krisda (Alek Teeradeth) watches her meltdown with good humor. And he seems to always have a handkerchief ready at a moment’s notice. Despite throwing cracks at her about her “old age,” Krisda has quite the old soul. Finally we have Nampeung (Vicky Sunisa), veteran actress in the entertainment industry. Acting is all she knows. But these days the new actresses are getting younger and younger, and she’s finding it difficult to compete. It also doesn’t help that she has a natural tendency to be jealous and petty. Patience is not one of her virtues. She truly believes that her former best friends were jealous of her beauty and ability to snag a man that they are constantly getting on her case that her college boyfriend is cheating on her. She had severed their friendship because of a man. Come to find, he was cheating on her but Nampeung would go to the grave before letting those nosy ex friends get that final satisfaction. She even vowed to be the first to marry, but because of her personality, she has yet to find a nice man to settle down with. The boss of her talent agency, Peet (Por Thrisadee), catches her eye when she realizes she has overlooked him. Divorced, rich and kind, Nampeung decides he would be her man or so help her god. Watch out for this lady, she has lots of tricks up her sleeves. Out of all of the men in this drama, Peet would have to be the Casanova. The show does a great job using tropes (and sometimes overused plot devices) into a storyline that works. There is more to the story than a few women trying to find a husband. The show explores the anxiety behind the feeling that some women may go through upon reaching a certain age: the need for comparison to other women and what they don’t have, the pressure to find someone when your clock is clearly ticking, and above all, living in a modern world with traditional expectations. I love that the heroines are flawed and dynamic. Through their search for Mr. Right Now, I hope that they find themselves, and mend their friendship. The show understands that there is nothing worse than women hurting women, so seeing that even though the women do things to spite each other, they also have each other’s back when it really matters. I feel badly for Nampeung the most because she is so clueless on how to behave in this ever-changing world, nor differentiate what’s reality and what’s in a drama, since all she knows is the entertainment world. I’m so glad that her ex friends have resurfaced, at least they may challenge her to be better and slap her around a time or two. I also love that we get to live vicariously through three very different women. I find myself adoring the men in this show, I can see them being a supportive pillar, always there for the ladies but not taking too much of the limelight. It doesn’t hurt that the leads have very good chemistry with each other: Joy-Alek, Benz-Aun and Vicky-Por. So I would be curious to see how the characters overcome their differences (core values and age) and make the relationship work. It’s a heartwarming show, painting a rosy picture but also realistic enough to capture important themes. Because as much this show is about the journey of love between a man and a woman, it is also about finding peace with yourself (and your age) and mending a broken friendship. The narrative and picture quality will take us right there with the characters. This weekend sleeper could very well be the cure for the common cold (at least for mine), or the cure from lakorn boredom this past few months. It’s just the no-nonsense, light-hearted lakorn that is needed. And three episodes in, I’m hooked. I want to watch this! It sounds so fun. 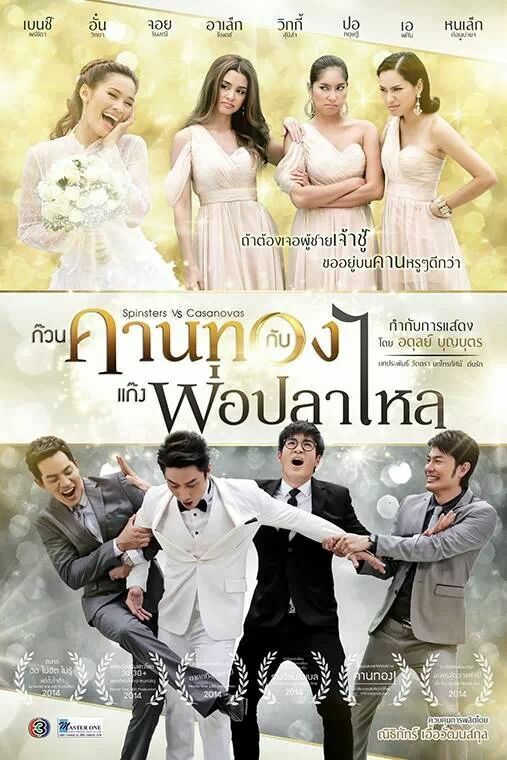 After watching the Thai Full House I’m still looking for another drama to hit the right note with me. How ironic. I have been looking forward to YLC but in the end, that lakorn really failed me. I can’t even continue without my best friend, the FF button. I think per episode I watch a minimum of 15 minutes out of an almost 2 hour episode. And KKTGGPPL came along from out of nowhere and found a place in my heart. I hope it remains poignant and fluffy, although I am far behind. I have priorities. It just so happen that multiple kdramas and varieties are dominating my watch list. Awe… The poster looks so FUN !!!! you just made my day fia. finally able to find the series on viki and favorited it to\day to watch later, and then tonight i see your review. and as for the couples i’m looking forward to most is a tie between benz and the club owner and the actress and peet. Just wanted to say that you write amazingly well. You synthesize the characters so well and it’s definitely a strength of yours. Watching this series even without English translations and really liking it so far. I love this quote! It’s a really good reindition of the famous quote in Pride and Prejudice by Jane Austen. The storyline seems interesting but my drama plate is full and if I find time I may be able to check an episode out. Though it’s probably not subbed in English. Lakorns should really do more noona romances, older girl-younger guy! I really do enjoy watching those type of storyline lines, despite it’s utter cliche-ness. Though unlike other people I don’t mind cliches as long as they don’t overuse it like crazy in the drama. i have seen enough noona kdramas that i often get tired of it but seeing it in lakorn is refreshing. the largest age gap i have seen far is secret affair. i think the gap is 15-20. @MadDino, I haven’t had to pleasure of watching Thai Full House yet, but I’m glad to hear you’ve enjoyed it. This particular lakorn is hard to get bored with because we get three different stories to tune in. @asl @Belle, I didn’t realize that this time of the year has so many dramas keeping everyone entertained. I was grasping at straws in the last few months, but finally found something that caught my attention. Sadly, I’m not too excited for YLC after such an anticipated start! @lidy, glad you enjoyed it! I can’t NOT write about a lakorn I’m obsessed over. @ 🙂 It is great fun! @Astra, thank YOU, that is the sweetest thing to say. Maybe I can stop doing recaps and just focus on writing whatever I want to write about? Heeh. It tends to come out more.. enjoying? i need to watch this. i cannot access Viki so Youtube is my only place. where can i find it on Youtube, please? Hi lilyalana – it’s not currently being subbed on youtube, but Sousday will pick this drama up after her finals. So stay tuned! May I know where I can watch ep8 onwards with eng subs?